LAS VEGAS, Jan. 8, 2013 –– LG Electronics (LG) today demonstrated its continued OLED TV market leadership with a revolutionary curved model, the EA9800, shown for the first time here today at the 2013 International CES. Featuring proprietary WRGB technology, the incredibly thin display features a dramatic curved design and a vivid picture quality that is practically indiscernible from colors found in nature. LG’s OLED TVs produce astoundingly vivid and realistic pictures, thanks to superior WRGB technology. This unique Four-Color Pixel system features a white sub-pixel, which works in conjunction with the conventional RGB setup to create the perfect color output. The built-in Color Refiner delivers even greater tonal enhancement, resulting in images that are more vibrant and natural than anything seen before. The 55-inch OLED TV also offers an infinite contrast ratio, which maintains optimal contrast levels regardless of ambient brightness or viewing angle. To complement the infinite contrast ratio and enable the richest color and deepest black expression, the High Dynamic Range (HDR) algorithm has been incorporated. This technology also ensures contrast ratio consistency and maximum color separation. As OLEDs generate their own light, there is no need for a separate backlight, enabling LG OLED TVs to boast a significantly reduced weight and depth, and a stylish, minimal appearance. The EA9800’s streamlined, ultra-modern design and curved screen remove any hint of visual distraction to maximize the viewing experience. Carbon Fiber-Reinforced Plastic (CFRP) has been implemented to further reduce unit weight and add additional strength to the beautifully curved screen. The OLED TV’s sleek styling and slim profile complement the stunning images brought about by LG’s WRGB technology, helping to create what is truly the ultimate immersive viewing experience. LG’s Paper Slim design effectively unifies screen and stand into a seamless aesthetic entity. Meanwhile, CINEMA SCREEN Design elements result in a narrow screen bezel which is practically invisible to the naked eye. A minimal bezel helps to produce a truly immersive 2D and 3D viewing experience. For installation versatility, the new model also ships with an easy-to-mount wall bracket that allows a single person to complete the entire installation. With less than a one-inch gap between wall and TV, LG’s design masterpiece can now be displayed like a true work of art. 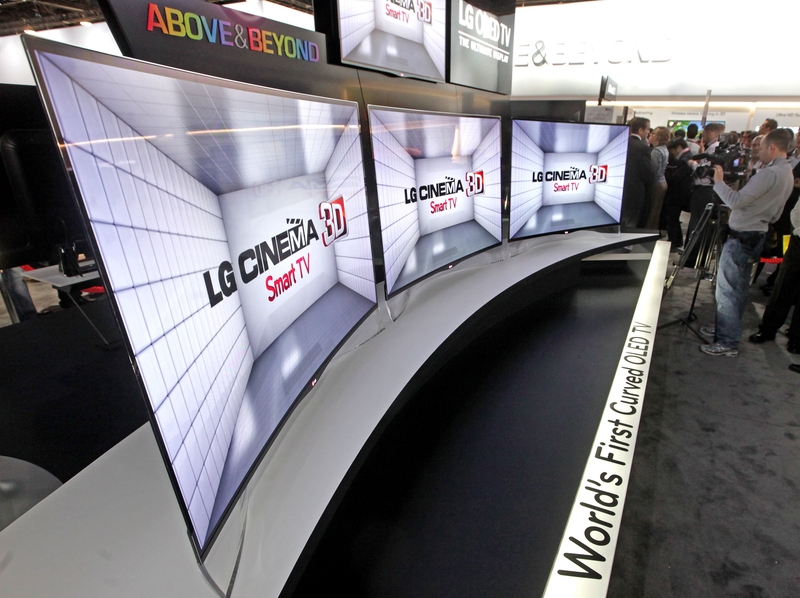 Additionally, Smart Touch Control further differentiates LG’s OLED TV designs from competing models. This new feature results in a more attractive appearance and a better control experience. Located below the screen, the sliding touch key provides the user with an intuitive and elegant way to control the OLED TVs basic functions, such as changing channels and volume, and powering on or off. LG’s OLED TVs combine the company’s industry-leading CINEMA 3D technology with Smart TV capabilities, creating the most immersive and comprehensive home entertainment experience possible.